Guess Who's Back On Board???? Another birthday request, and a special friend showed up to help the Captain relay his birthday wishes! After not being around for a few videos and getting a hold of the new "Goblin-Free" script for Episode 2 (illegally I may add), The Goblin begged to be back on the show. What could we do? He was, after all, our first monster so we brought him back for this special, quickly turned-around birthday greeting. We're not going to tell him, but we ALWAYS intended to bring him back when the time was right and he can always find a child's bed to lurk under in the meantime. He'll still getcha if you don't watch out! So what is it? Trash? Recyclables? NOOOO! It is raw T-Shirts. Raw T-Shirts that will soon have the new design screen printed on it! Okay, so it has been a long, long time since I announced I was going to offer shirts, but now...look! Look upon the assets and giggle along with me. Just trying to keep you up with developments as they happen! Off to the silk screeners and then I'll have a DATE....YES! 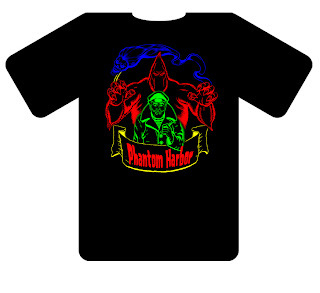 A DATE that the Phantom Harbor shirts will be available! Until then....I'll see you around the Harbor! So the Captain received a new birthday greeting request for a young woman who is a big fan of the Jonas Brothers and especially, Nick Jonas. During the shooting of the video, an unexpected visitor made a cameo and The Captain sprang into action! Take a look! I know you are tired of seeing incomplete set construction; I am too. However, in the spirit of taking you step-by-step through "the process" I finished constructing the Cargo Hold set and painted it today so I felt that after completing something this profound, you all would like to take a little walk in it with me. Now, it needs to be dressed with...well...cargo (you know, crates and barrels - hey, maybe I should just go to Crate & Barrel to dress the set? Nah, I doubt they have what I need). In any case, you know what this means???? It means it is nearly time to film the live action portion of Episode 2! Just need to get EELKA all squared away and then we go, go, GO! Thanks again for your patience. It is a long process, but believe me it will be worth it! 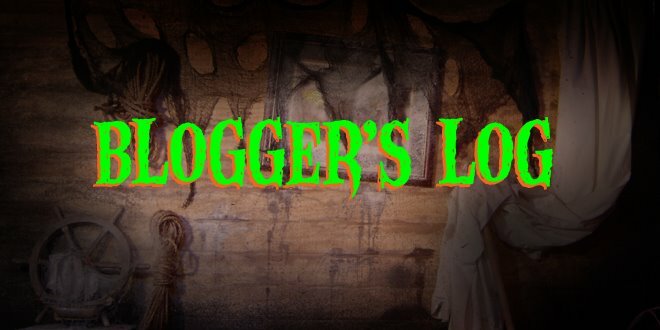 Live Blog Radio Interview TONIGHT! I've never done this before: I'll be on a LIVE BLOG radio show called The Worst Show on the Web where I'll be discussing....what else.....PHANTOM HARBOR! So, if you're bored why not tune in at 8:00 p.m. P.S.T. on www.worstshowontheweb.com and hopefully, I won't embarrass myself too much. I've been told that I'll have the ability to I.M. audience members WHILE I'm talking on the phone....eeek! Who knows how that will turn out? In any case, until next time, I'll see you at the Harbor. Pilot Episode Breaks 1000 Views! I know that number doesn't seem like a lot, especially when you consider that a dog having a nightmare can do 300 times the views (hell, I lost count of how many times I watched him run into the wall), but it is a symbolic victory for "the little horror show that could." Thanks to you and your unending support and patience, I now know that we CAN! We will endure despite the time lag between episodes and all of the work that I do personally to produce one 10 minute video. 2.) The T-Shirt Design was FINALLY finished. Again, a lot of agonizing went into producing this relatively simple design. Over this past weekend, I mocked up one using transfer paper and I will say this: It totally rocks! I believe everyone will be satisfied. 3.) Two birthday videos were completed. No small task, let me tell you. New props, new footage, all fun and sent ON TIME! Wowwee! So now, it is back to Episode 2 and Monsterpalooza preparation. There's much activity in Phantom Harbor and I thank you , thank you for your continued support. 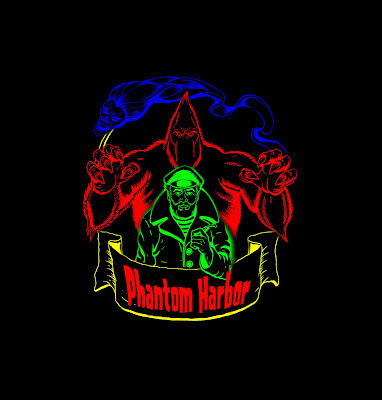 FINAL Phantom Harbor T-Shirt Design! I know, I know, I know, I know...the web site has been up since October (6 months, YAY!) and the first episode has just reached 1000 hits and I've been promising T-Shirts for a LONG time. Without going into a labored history, let's just say that I couldn't make up my mind as to what image I thought would best illustrate what we're trying to do with the show and the site. There were some early ideas that were artistically interesting but somehow didn't capture the fun I hope Phantom Harbor offers its fans. I had even enlisted the help of a talented graphic designer from Great Britain, Steve Noden, to give it a shot, and he did an awesome job, but something just wasn't right. I'll see you at the Harbor. Yes, the Captain received another request for a birthday video for Ms. Tamsyn Hunnewell. And of course, EELKA was there to furnish another cake! So remember, if you want a video message from the Captain sent to a loved on, write him at TheCaptain@phantomharbor.com and do it early so he has time to get a cake from the resident sea witch. It's on YOUTUBE; it's on AOL TV, now I've posted it here for you to check out! Monsterpalooza is a Monster Convention happening in May, 2009. The brainchild of Eliot Brodsky, the event boasts an impressive display of Hollywood Monsters, special guests, demonstrations, a dealer's room and yours truly. Come on by if you are in Burbank, CA the last weekend of May. I'll have the official PHANTOM HARBOR T-Shirts for sale and with a little luck, a preview of the highly anticipated 2nd episode. Until then, check out the video announcement below. See you around the Harbor. So Molly Jo Shea turned 20 on April 9th and the Ole Cap'n had to acknowledge this special event with a cake baked by EELKA, the Sea Witch. I suppose we won't see any of her handiwork on the Food Network any time soon! Until next time, see you around the Harbor!